Major General Scott G. West assumed command of the U.S. Army TACOM Life Cycle Management Command on 22 April 2008 following his assignment as the Commanding General of 21st Theater Sustainment Command. A native of Moses Lake, Washington, he was commissioned in the United States Army in June of 1976 following graduation from Eastern Washington University with a BA in History. His military education includes the Army Command and General Staff College and the Industrial College of the Armed Forces. His civilian education includes a MS in Logistics Management from the Florida Institute of Technology. MG West has held key command and staff positions in the 1st Infantry Division (Mechanized), 2d Infantry Division, 2d Armored Cavalry Regiment, 1st Corps Support Command, 6th Infantry Division (Light), 7th Infantry Division (Light) and 82d Airborne Division. Other assignments include Chief, Office of the Quartermaster General, Fort Lee, Virginia; Chief, Sustainment Division, Director for Logistics, Joint Chiefs of Staff, J4, the Pentagon, Washington DC; and Executive Officer to the Deputy Chief of Staff, G-4, United States Army. West commanded the United States Army Quartermaster Center and School and served as the 48th Quartermaster General of the Army. 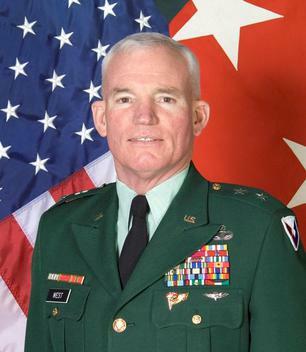 While serving as the Quartermaster General, MG West was detailed as the Deputy Chief of Staff for Logistics, Multi-National Force-Iraq (MNF-I) from July 2003 to July 2004. He then commanded the 21st Theater Support Command, Kaiserslautern, Germany from 1 September 2005 until 26 February 2008. His awards and decorations include the Army Distinguished Service Medal, Defense Superior Service Medal, Legion of Merit, Bronze Star, the Parachute Rigger, Pathfinder and Master Parachutist Badges.